Some years ago, I was on holiday on the island of Corfu. I was sat with our host, Dimitri, in the afternoon, enjoying a pint and big cigar, while talking about nothing. Holidays are good for that, you’ve got the time to talk about nothing and like it. In the distance I was watching the big rolling mountains that come up from the coast of Ipsos and move inland. The mountains on Corfu are very green; it’s the greenest of the Greek islands and can be very beautiful. When I think of bandit country, I think of the outlaws running to the hills in the old west, or maybe the Bandidos in South America. Even the resistance fighters in Europe during the war had their mountainside or woodland hideaways. 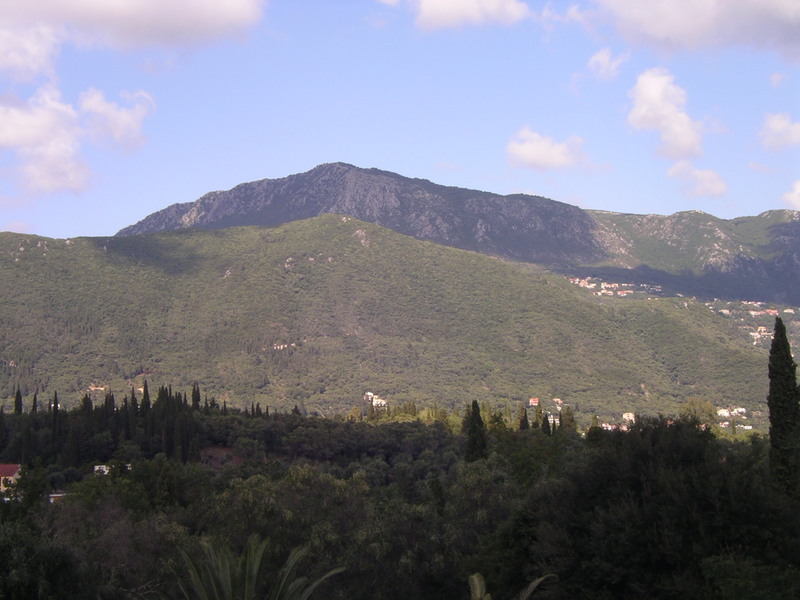 This mountain in Corfu looked just the place to hide a gang of desperate outlaws or build a mountain camp where you would base your fight against the evil overlords. It had just the perfect romanticism to set a novel about sweaty men with six-guns, bullet belts and incredibly large hats. Just like communicating through email or text message, the humor can sometimes be lost in translation, when speaking with someone whose first language is not the same as your own. I had to first explain what bandit country meant, then once I did, Dimitri was quite put out and told me there is no crime on Corfu and people don’t run to the hills to escape the police. It’s a very peaceful island. Once he got the joke, he told me there are only six police officers on the whole island, as that’s all they need. I’m not sure I believe him, as I’d already seen three in the small corner of it where I was staying, but I was happy to believe there are not many police per head of population, because seeing them about is quite rare, so he may have been right. He’s not the only person who’s told me the police are few and far between. I was having a smoke in a bar near the town and asked the owner about the smoking ban, as I know they do have one, but everyone seems to ignore it. I only asked, as we were actually inside the bar, not sat on tables outside, as is the norm in such nice weather. He told me that if the police did happen to be passing and they were also in an unusually bad mood that day, there’s a slim chance of getting a fifty Euro fine for smoking inside. It’s so rare though, he said he’s never seen it happen himself. Now that’s civilisation for you. I worked for a brewery chain in England when our smoking ban came in and I remember all the breweries accepting it with open arms. They believed everything they had been told about hoardes of non-smokers coming to the pubs after smoking was banned and the takings going through the roof. I don’t know if they were just inept or gullible. It certainly wasn’t something I’d given a great deal of thought to before the ban, but I did see that is was going to be a very bad thing and all the tales of non-smokers coming out of the woodwork and boosting the industry were simply not true and not even possible. Being a barman who smoked at the time, it became difficult for me to take a cigarette break, particularly if I was on the bar on my own, as I had to go outside, so I made my first serious attempt to quit. I was successful for five months. The reason I started again after five months was not because I was gasping for a smoke. That time was actually quite easy for me, after the initial shock of giving up something I really enjoyed. I started again because in that five months, the landscape had changed considerably. I was no longer running or working in pubs because they had all closed. Every one of the pubs in the managed chain I worked for had shut down, and don’t let anyone tell you it was due to cheap supermarket booze or the recession. It wasn’t, it was one hundred percent down to the smoking ban and I was there to see it for myself. That’s another story and I would be happy to tell it another time, if you care to hear it. I chose to start smoking again, because at the time, I was working as a temp in a call centre for a marketing firm and I saw no reason not to. Why a call centre? I needed the money. Smoking bans and the anti-smoker movement in general tend to do things like that. They push smokers out of their jobs and out of civilised society. At least we know it’s all for our own good eh? People flee to bandit country for many reasons, from running from the law, to fighting oppression, to simply escaping from a life they can no longer tolerate. My future plans are already laid out. Me and my wife plan to retire to Corfu in ten years or so. England is dead to me now. It’s not just the smoking ban, it’s the entire public health industry telling me I can’t eat salt, can’t drink sugary drinks, mustn’t gain weight and must live a life prescribed by the powers that be. It’s also the ‘anti’ racism industry telling me that everything I do as a white man is racist and that I should somehow be feeling guilt and atoning for things done by people long dead; things that I would never consider doing myself. It’s the gay ‘rights’ industry telling me there is something wrong with me because I am a straight man, the gun control industry telling me I have no right to self defence and my hobbies are killing children. The offence industry telling me I can’t say or do anything that might offend another person or they might put me in prison. That my free speech has been taken away and I can only have approved speech. No, it started with smoking, but it’s become so much more. The sad fact is that we are all being targeted in different ways for different reasons, but we’re not pulling together and fighting it. The smokers warned everyone else, but nobody listened and now they’re all too busy fighting their own private little war while demanding their right to clean air. The rolling hills of Corfu may not be bandit country now, but one day for me, it will be. I will be the exile from what my country has become. I will be the bandit and another place will be my bandit country. At least the weather is nice, the locals friendly and above all, I can smoke. “The Moose” is an English libertarian blogger who has been writing down his personal gripes about the smoking ban and other issues for many years. ++++ “The Moose” ist ein englischer libertärer Blogger, der seit vielen Jahren kritisch über das Rauchverbot und andere Themen schreibt. ++++ “The Moose” est un blogueur libertaire anglais qui a critiqué l’interdiction de fumer et d’autres sujets pendant de nombreuses année. You are spot on Moose. The anti-smoking crusade was but an early manifestation of a culture war that now spirals out of control. I live in Malaysia for much the same reason. That and the women, of course 😉 . As a Libertarian, I can’t understand why culture wars happen. What’s wrong with you do your thing and I’ll do mine? Lucky you and wonderful George Karelias cigarettes !